“In Pirkei Avot (Ethics of the Fathers), the sages note that the world stands on three things: Torah, Avodah and Gemilut Chasadim (acts of kindness).” The term “avodah” is associated with prayer and with the sacrificial service in the Temple, both important parts of Jewish life since the days of Abraham. The sages relate that the three services of the day (shacharit/morning, mincha/afternoon, and maariv/night) are connected, respectively, to the three patriarchs. Given that assertion, one who is familiar with a traditional Shabbat service might then ask, but what about Musaf? Musaf, which translates as additional, is the name of the prayer service that follows the reading of the Torah and the haftarah on Shabbat, as well as on Festivals and on Rosh Chodesh (celebration of the new month). It is primarily an additional Amidah, the silent standing prayer that is recited. Included in the Musaf service are references to the additional (musaf) sacrifices that were brought in the Temple on these special days. In the days of the Holy Temple (and, prior to that, the Tabernacle in the Wilderness),the Musaf offering consisted of two male lambs. Because there is no longer a Temple for worship, the additional Shabbat offering was transformed into a prayer. Thus, the main body of the Amidah recited in the Shabbat Musaf also includes a prayer for a return to Israel where the sacrifices will once again be offered, the recitation of Numbers 28:9-10 (“On the Sabbath day, two first year lambs, unblemished...”) and a prayer for the Jewish people to be able to fully rejoice on Shabbat. On Shabbat, take an extra moment to talk to God. On May 30, 1854, President Franklin Pierce signed the Kansas-Nebraska Act, which officially defined the territories of Kansas and Nebraska and opened up a significant part of what became known as the “Wild West.” From outlaws to “Indians,” the dangers and adventures of the “Wild West” have been a rich source of tales that have been recorded and reenacted in the full range of entertainment media. Among the Jews who moved west to settle the land there were many traders and merchants as well as farmers. In the “Wild West,” even those with commercial interests were sometimes part of the great adventure. Born in Prussia in 1851,* Julius Meyer arrived in Nebraska in the 1860s to join his brothers in trade. Legend has it that he was captured by Ponca People and was saved from being scalped by Chief Standing Bear. This began a relationship that would allow Meyer to make his mark upon the world. 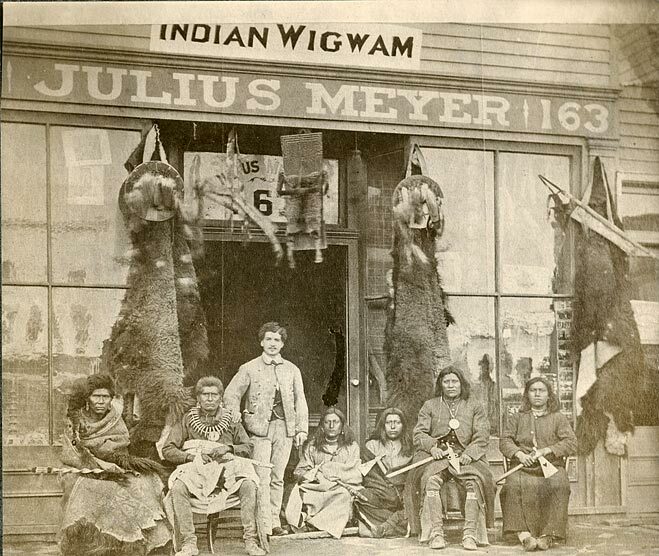 Meyer felt comfortable among the different tribes and became fluent in six different tribal languages. 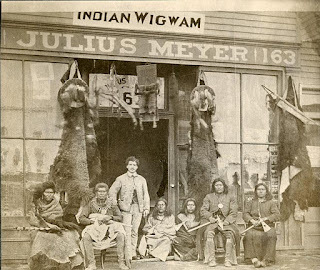 Meyer’s interactions with the local Native Americans helped build his trading business (including his curio shop The Indian Wigwam). His respectful attitude and the personal interest he took in the tribes, set him apart from many of the other American settlers. In fact, Meyer’s was given the name “Curly-Headed White Chief with One Tongue.” The term “one tongue” was in honor of his honesty, for a person with one tongue cannot speak out of two-sides of his mouth. 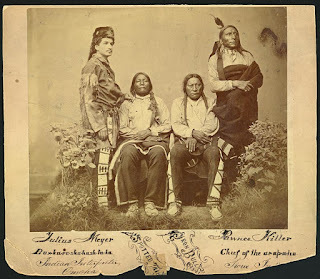 Little more is actually known about Meyer other than that he served as both an interpreter for the Native Americans to Congress and as an “Indian Agent” for the government. 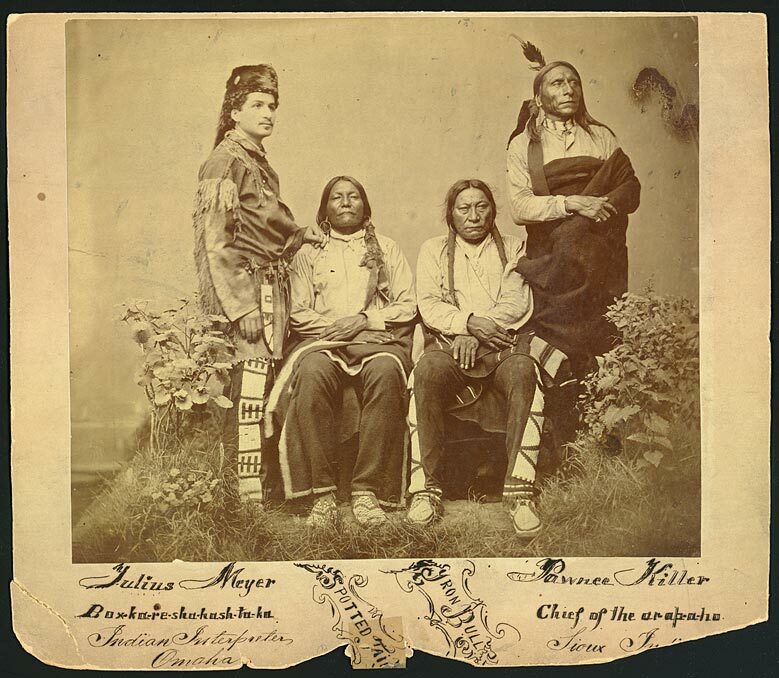 However, Meyer left behind a rare trail of photographs from the era, including a photograph of himself with Spotted Tail, Iron Bull and Pawnee Killer. Additionally, records state that Meyer was involved with both the first synagogue in Nebraska, Congregation of Israel of Omaha (now Temple Israel), and Omaha’s Hebrew Benevolent Society. Step out of your comfort zone and take a positive attitude toward building community relations. Can You Be The Tenth? That the Hebrew word “minyan” derives from the infinitive “lim’not,” to count or number, is not at all surprising. A minyan is a quorum of 10, the smallest number necessary to create a formal “congregation.” It is customary to have a minyan for certain life cycle events (such as a brit milah - circumcision). However, most people are familiar with the term minyan in reference to prayer, since, ideally, Jewish prayer takes place with a minyan, allowing the full service to be recited. According to the Talmud (Megillah 23b), certain prayers of sanctity (such as Kaddish) can only be recited in the presence of a minyan. This is understood from the verse, “And I [God] shall be sanctified in the midst of the Children of Israel” (Leviticus 22:32). What determines being “in the midst”? Two people? Five people? We see, especially from the verse concerning the scouts, whose lack of faith leads to the punishment of the entire nation, how powerful a group of 10 can be, impacting on the very destiny of Israel. On the other hand, when Abraham prays to God to spare the city of Sodom (Genesis 18:32), he stops negotiating when he reaches 10 righteous people, indicating that a group of 10 virtuous people (but not less) can bring salvation to an entire city. This Treat was last posted on June 4, 2010. *The Babylonian Talmud Brachot 21b is also a source for the equation of ten as the minimum for a congregation. If you are not currently a member of a congregation, find a synagogue near you and explore their membership options. Healthcare is a topic that is frequently in the news and part of the current public discourse. Because of both religious discrimination and the specific needs of the community, it was not uncommon to find specifically Jewish hospitals in major cities. One excellent example of the development of Jewish hospitals in America is The Jews’ Hospital of New York (now known as Mount Sinai Hospital), which was founded in 1852. Although there were nine representatives of Jewish charities who agreed to the creation of a charity hospital for Jews, the name most closely aligned with the launch of The Jews Hospital is Sampson Simson (1780-1857), an American born Jewish philanthropist. Not only did Simson donate the land on which the hospital was built (West 28th Street between 7th and 8th Avenues), but he served as the first president of the Board of Directors. The Jews Hospital of New York accepted its first patient on 19th Sivan (June 5) 1855. While people of all faiths were welcome, the majority of patients were immigrant Jews. With the outbreak of the Civil War, however, the demands for the hospital’s facilities greatly increased. Having expanded its mission to accommodate the war, The Jews' Hospital formally retired its sectarian charter in 1866 and renamed itself The Mount Sinai Hospital. The formerly Jewish hospital was, however, better able to care for the religious needs of its Jewish patients (kosher food) and offered opportunities that Jewish medical professionals might not have found elsewhere in those times when Jews were barred from certain professions and suffered academic quotas. If a friend is in the hospital (and up for visitors), clear an hour of your schedule to participate in the mitzvah of bikur cholim (visiting the sick). All soldiers must be brave, but some go above and beyond their duty and give their lives so that others my live. In honor of Memorial Day, Jewish Treats introduces two brave young American Jews who, because of their courageous acts, were awarded the Congressional Medal of Honor. Isadore Jachman was 22 years old when he demonstrated his outstanding bravery at the village of Flamierge, Belgium. Born in Berlin, but raised from the age of 2 in Baltimore, Maryland, Jachman was a Staff Sergeant in the 513th Parachute Infantry Regiment. When his unit was trapped by the enemy, Jachman ran into the open area, grabbed a bazooka from a fallen comrade and managed to drive off two enemy tanks (actually damaging one of them). Sadly, the wounds he received were fatal, and he passed away that same day, January 4, 1945. In addition to receiving, posthumously, the Congressional Medal of Honor, Jachman’s courage was acknowledged with a statue in the village of Flamierge. Raymond Zussman was born and raised in Michigan. Following his basic training in 1941, he was sent to Armored Officers School and then served as a tank instructor, before being deployed to Europe. 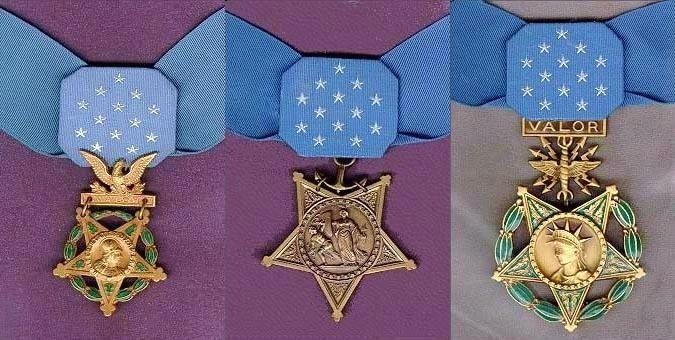 The battle for which Second Lieutenant Zussman was issued a Congressional Medal of Honor took place on September 12, 1944 at Noroy le Bourg, France. When his lead tank was stopped, Second Lieutenant Zussman, armed with only a carbine rifle, led his one remaining tank and accompanying infantry on foot. Scouting ahead on foot and under constant fire, Second Lieutenant Zussman led his men to destroy a road block and defeat several enemy-held houses from which machine guns were being fired. When the battle was finally over, 18 enemy soldiers had been killed and 92 had been captured. Second Lieutenant Zussman received no fatal wounds while leading this heroic charge. Sadly, however, he died 9 days later from wounds he received when a mortar exploded next to him while he was resting after battle. If you know of any Jewish servicemen/women who gave their lives for the country, honor them by visiting their graves. According to tradition, Judah earned for his descendants the right to kingship because of his ability to acknowledge his own mistakes, accept responsibility for his actions and alter his course of action. The kingship of David, the most famous descendant of this tribe, was the beginning of a dynasty that would outlast the kingdom itself, as the Messiah is destined to come from this line. Even before David, however, the tribe of Judah, which was the largest of the tribes, provided Israel with leaders, men of strong will and solid judgment (indeed, the very first of the Judges, Othniel, was from the tribe of Judah). As the tribe of leadership, Judah was the first tribe in the marching order in the Wilderness, as well as the first tribe to enter Canaan and conquer its own land. Their strength in battle fulfilled Moses' prayer for them (Deuteronomy. 33:7): "Listen, God, to Judah's voice, and return him to his people; may his hands fight his grievance and may You be a Helper against his enemies." Judah's natural quality of leadership was also reflected by other members of the tribe of Judah such as Nachshon the son of Amminadab, and Caleb the son of Yephunneh. Nachshon led the Israelites into the Sea of Reeds when they hesitated in fear. With the Egyptian army behind them, the water before them, and only his faith in God, Nachshon walked into the water. When he was nose deep, the waters tore themselves apart and the children of Israel followed Nachshon on dry land. Caleb represented the tribe of Judah when Moses sent a man from each tribe to scout the Promised Land. When they returned, ten of the scouts reported that the land's inhabitants were fierce and unconquerable. Caleb and Joshua the son of Nun refuted these claims and tried to rally the people to keep the faith. After all, God had promised the land to them, so it must be that with God's help they would be able to conquer it. Caleb was later given the area of Hebron, which he had personally scouted 39 years earlier. Follow the path of Judah and be a leader by taking responsibility for your actions. The last century has seen the rise, fall and transformation of several major economic-political philosophies (socialism, communism, capitalism). The primary economic philosophy of the Torah is, fundamentally, ethical fairness. If one works hard and becomes rich, wonderful--just don’t forget those less fortunate. Jewish business ethics are derived directly from the Torah. 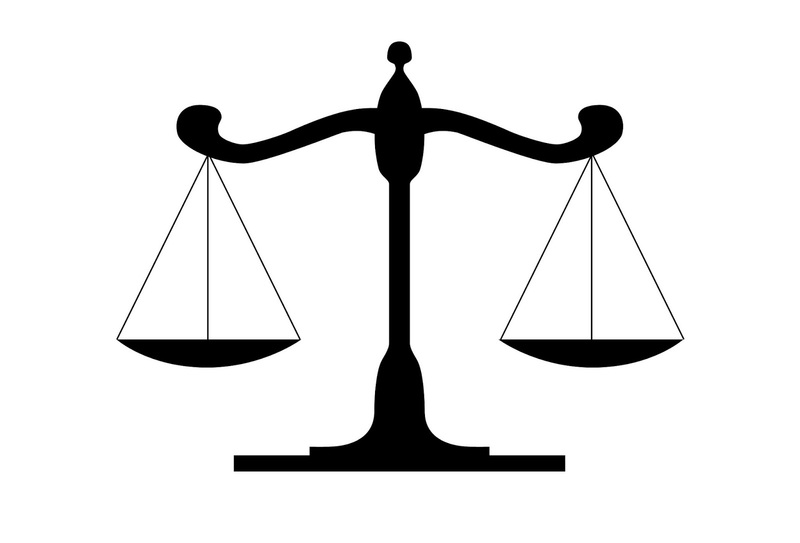 For instance, “You shall do no injustice in judgment, in length, in weight, or in measure” (Leviticus 19:35). Common sense would certainly assume that every society abides by a rule such as this. After all, no one wants to be cheated. And yet the desire to cheat is quite tantalizing. We read about crooked business dealings all the time. In the 14th century, Rabbi Yaakov ben Asher (“Ba’al Ha’turim,” Spain, 1270 - c.1340) wrote, in the business section of his legal code Arba’ah Turim, that a community is required to appoint people to examine all public scales and measures and to oversee the community’s businesses. These officials, he instructed, must have the ability to fine or punish (Choshen Mishpat 231:2). People will always look for ways to “get ahead.” Any success they have through such immoral measures, however, is counter-balanced on the heavenly scale. In fact, the sages declared that “Punishment for [false] measures is more severe than the punishment for illicit sexual relations" (Talmud Baba Batra 88b). Why? Because you can cease doing, and repent from, illicit relations. In order to fully repent from false measures, however, one must be able to make financial restitution to those who were cheated, and that is often very hard to do, especially when stealing from the public. This Treat was last posted on December 28, 2009. Make certain to always use fair billing practices. For those starting the study of kashrut (Jewish dietary laws), the status of eggs is almost always one of the first issues encountered. Since an egg comes from a chicken (or other kosher bird) which is considered meat, does an egg also have the status of meat? The pareve/meat status is not the only kashrut question related to eggs. Blood spots are also an issue to consider. “If there was found on it a spot of blood, the blood must be thrown away and the rest [of the egg] may be eaten...Dashai, the father of Aptoriki, taught ‘this rule applies only if [the spot of blood] was found on the white, but if found on the yolk, the whole egg is forbidden” (Talmud Chullin 64b). Because most eggs today come from hen houses and are thus unfertilized, blood spots are also quite rare. * And while most rabbis agree that a blood spot can simply be removed, it is, nevertheless, customary before use, to crack each egg into a clear container to check for blood spots. Additionally, when a blood spot is found, most consumers discard the entire egg. 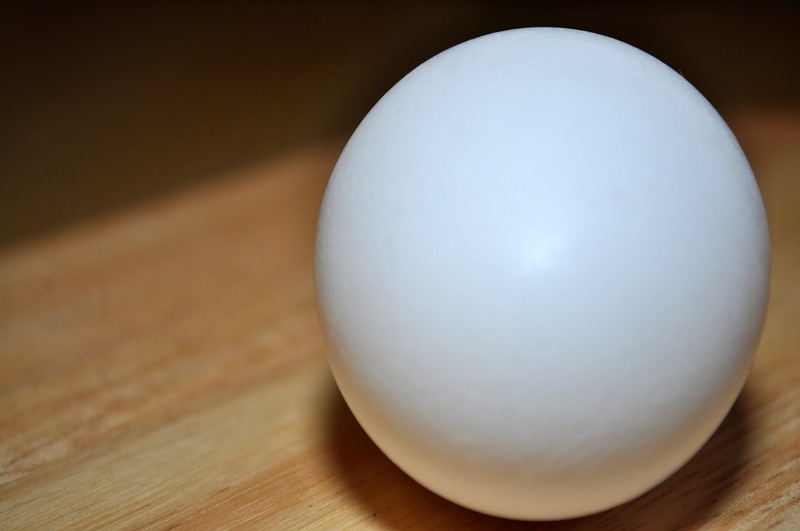 In the case of boiled eggs, it is customary to prepare a minimum of three eggs at a time so that an unnoticed blood spot would be nullified by the majority and not render the pot unkosher. *Brown eggs and fresh farm eggs have a significantly higher percentage of blood spots. Eating a healthy and well balanced diet is part of the mitzvah of taking care of one's body. “Foodies” everywhere might appreciate the fact that some people see the exceptionally wide variety of textures and flavors that are found in food as proof of God’s desire for humankind to not only live in the world, but to enjoy it as well. Physically, the manna is described as being “a fine, scale-like thing, fine as the hoar-frost on the ground” (Exodus 16:14) that lay just under the morning dew upon the Wilderness each morning (except on Shabbat). Furthermore, it is described as being “like coriander seed, white” (Exodus 16:31). It is interesting to note, that long before the peoples’ complaints, God was already prepared to provide food in the wilderness. It is recorded in Pirkei Avot/Ethics of the Fathers, that the manna was one of the ten things created by God at twilight on the eve of the first Shabbat” (5:9). *According to Rashi, quoting Midrash Sifri, Manna could taste like any food except the cucumbers, watermelons, leeks, onions, and garlic because these foods might be harmful to nursing mothers. Explore the many food tastes and textures God provided for us to enjoy, but don't forget to express your thanks to the Creator. 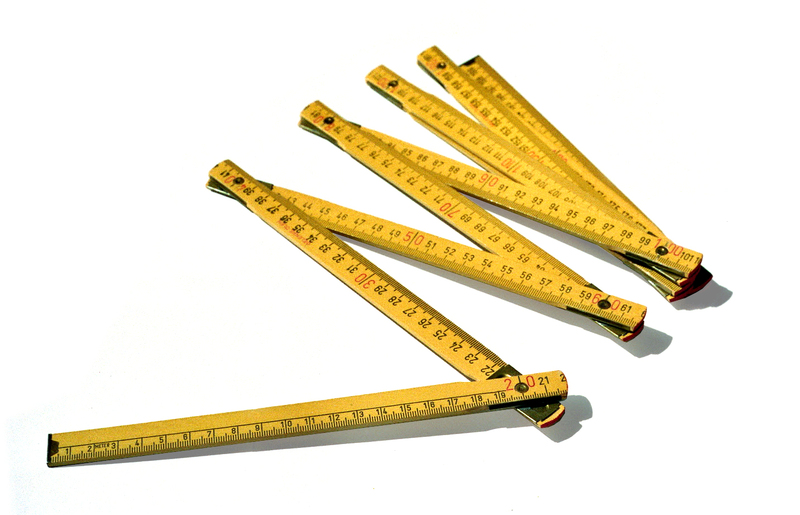 In honor of World Metrology Day, which celebrates the 1875 Metre Convention that established a worldwide uniformity of measurement (with the notable exception of the United States), today’s Jewish Treat focuses on measurements in Jewish law. The Torah and the Talmud use measurements not only to describe significant structures in the biblical narrative (Noah’s ark, the Holy Temple), but also to ensure the proper fulfillment of certain mitzvot (building a sukkah, eating matzah at the Passover seder, etc.). Unlike the metric system celebrated today, which is based on a standard measure prototype, biblical/talmudic measurements were based on those things that were always on hand. Measurements of length were, for the most part, based on body parts. This was particularly true of smaller measurements such as: etzbah (plural: etzba’ot) - fingerlength; tefach (plural: t’fachim) - the measure of a palm or fist, sometimes referred to as a handbreadth; zeret (plural: z’ratot) - handspan; and, perhaps the best known small measurement of length, amah (plural: amot) - a cubit, which was two z’ratot, or the length from the tip of the middle finger to the elbow. Other larger terms of measurement were borrowed from the surrounding cultures, such as mil (plural milin), a Roman term that signified the length of approximately 2000 amot, and parsa (plural parsa'ot), a Persian measure of approximately 4 milin. Measure the weight of your words, and be careful not to say anything hurtful to others. The observance of Shabbat is the fourth of the Ten Commandments, listed in both Exodus and Deuteronomy. One would expect to find no difference in the wording of the Ten Commandments from one Biblical Book to the next. However, the wording of the Fourth Commandment differs in two major ways. On the whole, however, the two commandments are the same--whether remembered or guarded, Shabbat is to be made holy and no creative work (m’la’cha) is to be done on it. Indeed, according to Jewish tradition, when God told the Jewish people the Ten Commandments, He spoke the words zachor and shamor at the same instant (Rosh Hashanah 27a), illustrating the fact that there are two important aspects to the observance of Shabbat. Guard the Sabbath, shamor, refers to the prohibited acts which serve to ensure that the day remains holy. These are "creative labors" known as m'la'chot, which includes such acts as cooking, planting, and writing. Zachor (Remember) refers to the positive commandments: reciting Kiddush (the blessing over the wine), having three meals, lighting the candles, etc. Remembering Shabbat also refers to the constant focus on Shabbat--represented in the fact that the Hebrew names of the days of the week are the First Day to Shabbat, the Second Day to Shabbat, the Third Day to Shabbat....Shabbat. The days count up to Shabbat, just as Jews spend their week looking forward to and preparing for Shabbat. By wearing nice clothing, drinking wine, eating a full sit-down meal, inviting guests, etc., Jews around the world transform the seventh day into Shabbat on a weekly basis. This Treat was last posted on February 25, 2011. Light candles tonight in honor of Shabbat. This Treat was last posted on May 22, 2012. When Elimelech and his two sons died, Naomi chose to return to her homeland. Her two daughters-in-law, Ruth and Orpah, decided to go with her. When they reached Israel, however, Naomi urged them to go back to their fathers’ homes. Orpah did leave. Ruth refused, declaring: "Where you [Naomi] go, I shall go, your people will be my people, your land will be my land, and your God will be my God." Boaz and Ruth married and their son, Oved, was the grandfather of King David. The Book of Ruth is read on Shavuot. This Treat was originally posted on May 25, 2012. Jewish Treats wishes you all a wonderful holiday. One fascinating juxtaposition of the two festivals is that whereas on Passover there is a prohibition against eating bread, on Shavuot the priests brought a special Offering of the Two Loaves (of bread) in the Temple. In fact, they were specifically leaven bread (chametz), as opposed to the unleavened bread (matzah) of Passover. The holiday of Shavuot is also known as Chag Habikurim, the Holiday of the First Fruits, because of the offering of the first fruits that was brought to the Temple. Although the Offering of the Two Loaves was officially separate, it was another form of offering “first fruits,” as the Two Loaves were made from the first cut of the new wheat harvest. Generally, when one thinks of sacred Jewish bread, one pictures beautifully braided challahs, perhaps the stunning twelve (or more) stranded challahs often seen at weddings or bar/bat mitzvahs. Actually, the Offering of the Two Loaves were shaped like large bricks. Their dimensions were seven hand-breadths long, four and a half hand breadths wide and four 'fingers' high (approximately 22 inches x 9.5 inches x 3 inches). The rules associated with the Two Loaves go into great detail as to the preparation of the wheat and the loaves. The Torah instructs that the two loaves be taken as a wave offering, after which each of the priests is given a small piece to consume with a portion of the peace offerings. All of this comes to underscore our constant dependence upon G-d for our sustenance and our gratitude to Him for our total well-being. This Treat was originally posted on May 18, 2009. Prepare for Shavuot by baking Challah. Here is a delicious recipe. This Treat was originally posted on July 21, 2009. Motherhood, therefore, is both a choice and an opportunity. And it is because of this choice, and the sacrifices inherent therein, that one must give his/her mother honor, respect and even gratitude, not just on Mother’s Day, but everyday. This post was previously treated on May 13, 2012, May 8, 2011, May 9, 2010, and May 8, 2009. If you have not yet, call your mother and just say thank you. So, if one understands the Midrash correctly, it sounds like the so-called “chosen people” were God's last choice for receiving the Torah. However, God understood that, unlike the other nations, the Israelites were truly free to accept the Torah since they did not yet have a homeland, they did not yet have an existing government, culture or “way of life.” It was this freedom that God gave them when He brought them out of Egypt into the wilderness that made the Jews more inclined to receive the Torah. They were not chained to a pre-existing life-style and thus were not reluctant to change themselves for the better. This is the practical reason why the Jews were able to accept the Torah so readily. This Treat was originally posted on May 23, 2012. Make a choice to have a more active Jewish life. Shavuot, which we begin celebrating Tuesday night (May 14th), is the only holiday in the Torah not listed by the date on which it is to be observed. Rather, the Torah teaches that this festival takes place on the day following the 49th day after the first day of Passover (see Counting of the Omer). The name Shavuot, therefore, reflects the fact that this holiday occurs seven complete weeks (shavuot) after Passover. In mystical terms, the number 7 represents the natural order of things, and so, a complete, natural cycle has occurred. When the Israelites left Egypt, the people acted as though they were merely cousins bonded by mutual misery. By the end of seven weeks, however, at the base of Mount Sinai, the former slaves rose above their human limitations and, by accepting the Torah, took upon themselves a total commitment to God, the final step in becoming the Nation of Israel. Shavuot is therefore also known as Z'man Matan Torateinu, the time of the giving of our Torah. This Treat was originally published on May 21, 2012. This Treat was last posted on February 12, 2009. Make preparations to celebrate Shavuot next week. from the fact that it is the closest location to where the Holy of Holies was located in the Temple. This Treat was last posted on May 18, 2012. Pay a virtual visit to Jerusalem via Kotel cam. In the past, it was common for people to learn a trade by serving as an apprentice. If one wished to learn a trade different from that of one's family, a professional was paid by the young person or the youth's family to teach him. Although the Torah does not formally discuss life details such as apprenticeships, it was noted in Midrash Numbers Rabbah that such a training program is alluded to in the instructions given to the Levites. In Numbers 4, it is instructed that the census of each Levite family was to be "from thirty years old and upward even until fifty years old, all that enter upon the service, to do work in the tent of meeting" (Numbers 4:3). However, in Numbers 8 it is written that "This is that which pertains to the Levites: from twenty-five years old and upward they shall go in to perform the service in the work of the tent of meeting" (Number 8:24). If the Levites were to serve in the tent of meeting from the ages of twenty-five to fifty, why were the individual families counted only after reaching the age of thirty? Our sages explain that this is done "only to tell you that all those five years, from the age of twenty-five to the age of thirty, he [the Levite] served his apprenticeship and from that time onward he was allowed to draw near to do the service" (Numbers Rabbah 6:3). The fact that the Levites served an internship is interesting. But, more fascinating is the "life-coaching" lesson that the sages learned from the apprenticeships of the Levites. The Midrash continues to state: "From here it has been inferred that a person who sees no sign of success in his studies within a period of five years, will never see it any more. Rabbi Jose says three years..."
Don't hesitate to give advice to someone who wishes to go into the same line of work as you. Raised in Charleston, South Carolina, Judah P. Benjamin (1811, St. Croix - 1884, Paris) was 14 years old when he left home to attend Yale Law School. (For unknown reasons, he did not graduate.) By age 21, he was settled in New Orleans, had passed the Louisiana bar and began practicing law. In addition to his work as a lawyer, Benjamin also was a founder of the Illinois Central Railroad and the owner of a sugar plantation (and its 140 slaves whom he eventually freed). After being involved in state politics for a number of years, Benjamin was elected to the United States Senate in 1852. He was the second senator of Jewish ancestry (the first was David Levy Yulee). During his involvement in national politics, Benjamin was twice offered a seat on the Supreme Court. Benjamin was, at heart, a Southerner. When the southern states seceded in 1861, he went with them. A close friend of Confederate President Jefferson Davis, Benjamin was first appointed Attorney-General to the Confederacy and then Secretary of War. When Roanoke Island fell to the Union, Benjamin was vilified for not sending supplies and back-up forces. It later came to light, however, that he had allowed the blame to fall on himself rather than let the Union know just how much the Confederates were lacking in soldiers and supplies. He stepped down as Secretary of War and was appointed Secretary of State. Following the assassination of President Abraham Lincoln on April 14, 1865, Benjamin settled in England. Many false rumors connected him to the assassination, and he feared for his safety. Since the British colony of St. Croix was his place of birth, Benjamin had British citizenship. Once established in London, he resumed his practice of law and eventually attained the rank of Queen's Counsel. Upon his retirement Benjamin settled in Paris, where he passed away on May 6, 1884, at the age of 72.